Nothing says fall quite like visiting with friends while roasting marshmallows around a roaring fire. Few of us live where we can have a traditional bonfire, but these days you can have a fire on your patio safely. 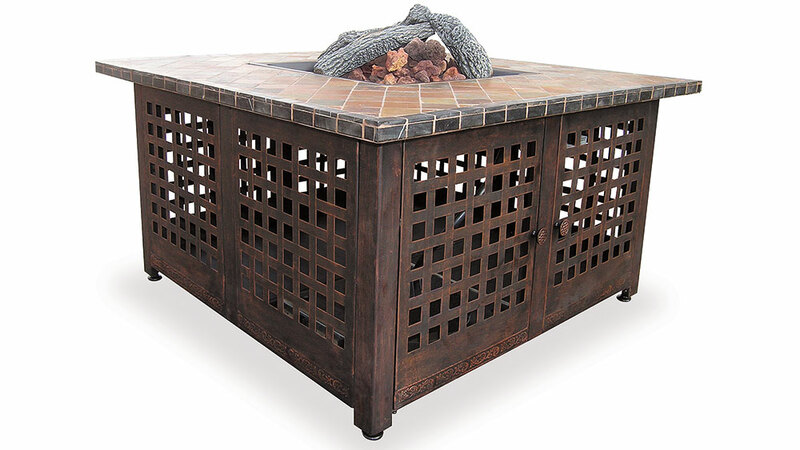 And there are all sorts of sizes and styles of “firepits” to choose from. Need one you can move out of the way if you need more space or haul into the garage for winter? Before you run out and buy the first model you see, here are some things to consider. 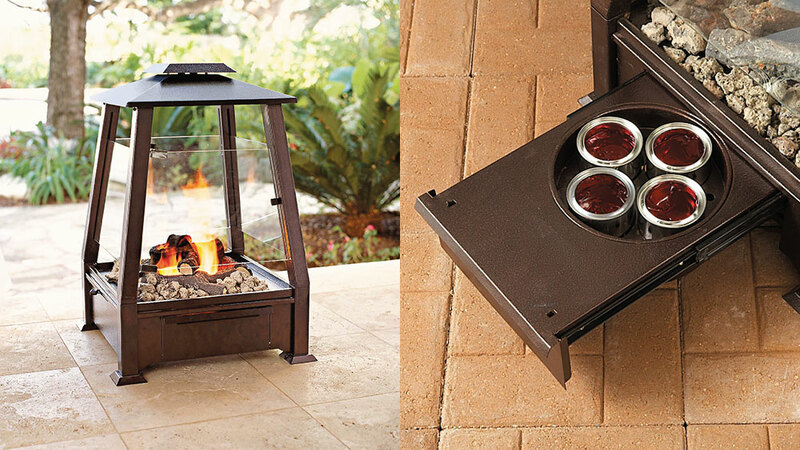 How do you want to use your firepit? If grilling hot dogs and roasting marshmallows over a flame is your style, then buy a cauldron or bowl style. They sit lower to the ground, are typically wood-burning and may have a grill for cooking. The no-fuss fireplace in photo 2 allows you to watch the fire from any angle. Its classic Mission style will fit in perfectly with nearly any decor. If you like to entertain in the evening, coffee-table and dinner-table styles allow guests to gather around. There are three fuels you can use in a firepit: Wood, gas or gel. Wood-burning fires give you crackling logs, glowing embers, great atmosphere and enough heat to keep you warm and to do a little cooking. 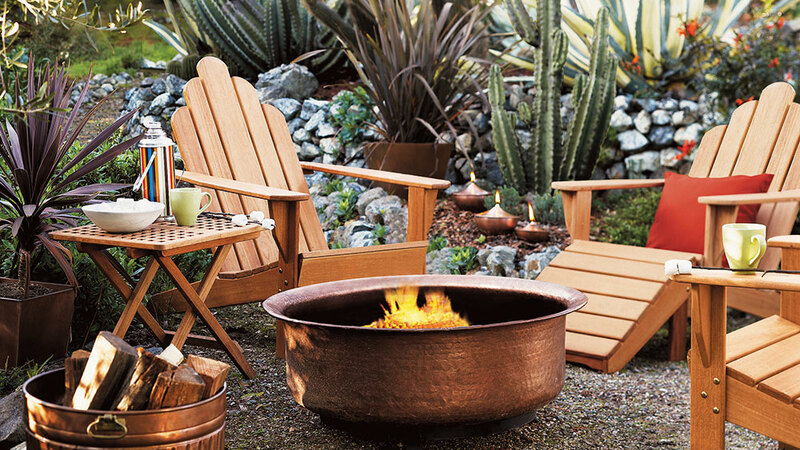 For a wood-burning firepit, you’ll need a dry place to store wood. Unless you’re a Boy Scout, starting a wood fire can sometimes be tricky, and, for safety, you’d better plan on staying around until the embers have burned out completely. That’s where gel and gas have an advantage — you can turn them on and off quickly. You can even adjust the flame to set the mood or put out more heat. Gel fuel firepits don’t produce smoke or soot. Pop the top off the canister, light it and slide it into place. Flames lick the ceramic logs, and some gels even crackle like a wood-burning fire. However, gel fires won’t produce enough heat to keep you toasty warm and the canisters can be expensive. If you’re looking for a heat-producing firepit that also burns without soot or smoke, try a gas unit. Flip the switch and you can have instant fire. They do put out more heat than gel, but refilling the tank can be costly, especially if you like to have lots of fires. See also Fire Restrictions: What Does a Fire Ban Mean? Before you buy, check your city code or call the fire marshal for regulations on size, placement and burning restrictions in your area. Place your firepit on a level, inflammable surface at least 3 feet away from the house, patio furniture and overhanging branches. And always keep a fire extinguisher or a bucket of water or sand close at hand in case of an emergency. A low, open bowl allows you to use larger logs. Clean burning gel fuels provide all the fire atmosphere. Make a fire by sliding out the bottom drawer, lighting the gel fuel canisters and pushing the drawer back in. Coffee tables aren’t just for indoors anymore. Dancing flames will make it the center of attention.